Sometimes i stumble upon some graphic replacement hacks that are so impressive that it's hard to believe that despite the systems limitations it can looks this good, and the romhack “New New New New Mario Bros” is one of these! This is a graphic replacement hack for Mario Bros. Classic Series. This game is an improved version of Mario Bros released by Nintendo, if you want to know more about this version of Mario Bros you can read more about it in a review that i wrote here on Indie Retro News. The “New New New New Mario Bros” was released quite a few years ago now by MacBee who did an impressive graphic improvement to the original game. The color palette has has a beautiful pink/purple neon style. The sprites for Mario/Luigi and all the enemies are now even more detailed with better coloring and some really nice antialiasing. And the new font just fits perfect with the new colors and graphic style! MacBee has done a lot of romhacks that are available to download from romhacking.net and he has also released a pc game called "Tcheco in the Castle of Lucio" that we covered here on Indie Retro News. And MacBee is now working on a sequel that will be released on Steam. 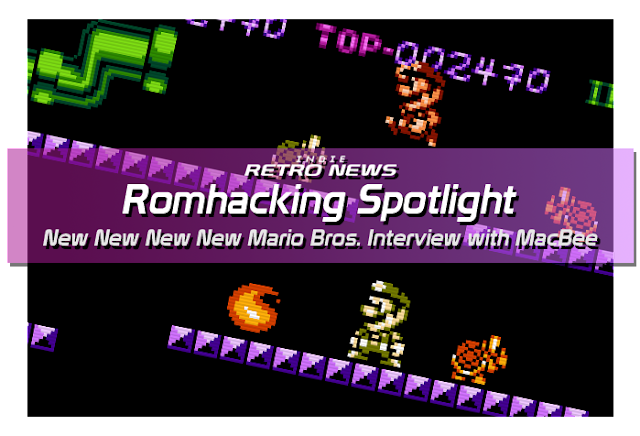 I wanted to know more about this hack so I got in contact with MacBee for a short interview of his background with gaming and romhacking and the process of creating this beautiful graphics hack of Mario Bros.
#1: Tell us a bit about yourself and how you got into romhacking. I'm Marcelo Barbosa, from Brazil. I started hacking NES games back in late 90s (using Nesticle emulator to make visual changes in real time). Now I'm sort of retired (occasionally still making small contributions/giving advice in other people's projects like Nesrocks' Ghostbusters Remastered for instance) and my focus now are original retro games for PC. NES is my favorite console and even when I was a kid I wanted to understand this machine better and make games for it. So Romhacking was a nice way to learn more about this console. I still apply what I've learn in my current retro projects for PC. #2: Tell us why you did a graphics hack for Mario Bros and how the process of the hack was. And also tell us some more about how you did the new graphics and the overall style of the new look. "New New New New Mario Bros." is a very old project (released back in 2007) so I may have difficulties to remember all details. 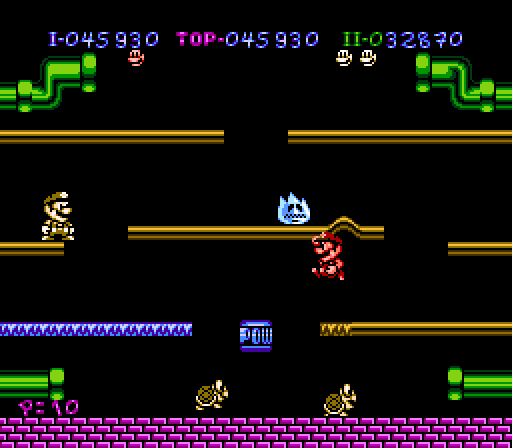 Most of my hacks were done because I wanted to make visual improvements on some of oldest NES games. Mario Bros was very simple (NROM game, not too many graphics) so I thought it could be a fast project. I also wanted to change it because it's a game running in a black background. NES sprites can have only 3 colors, so I wanted to use this black color (from background) as a fourth sprite color and see if they could look more detailed. It was a quick, satisfying project (not something I can say about all my hacks). I could use antialiasing on graphics due to the similar color I've used on each sprite and I remember I was proud of specific new graphics (like the turtles and pipes for instance). Unfortunately Mario and Luigi looked very "monochromatic" (despite being recognizable with these new graphics). If it was a more advanced hack - or even a homebrew made from scratch - I certainly would use sprite layering or other tricks to give Mario and Luigi different colors for their clothes. I would make it look different if I could however I like the aesthetics of this hack. There are few colors - but some shades of these few colors. 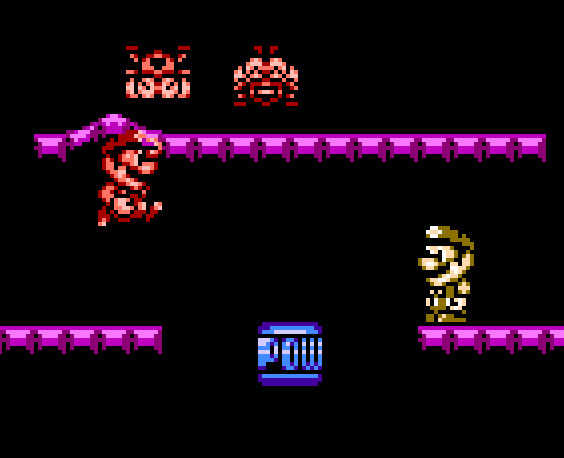 From all my hacks this is the one where I could play a lot with high contrast, make sprites "shine" due to different tones and tried to make characters look as cartoony/detailed as I could. I believe that all graphics were drawn directly in game since I have no external files with art or sketches of this project. The only graphics created before were the font characters. They were made by myself for a Wrecking Crew hack back in 2000, then reused in my only SNES hack (Super Mario Dream World) in 2001 -- and finally used for third and last time in New New New New Mario Bros. 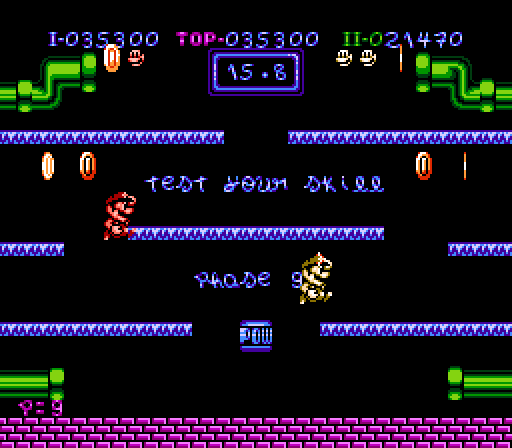 I'm attaching screens of the original Mario Bros.
#3: Do you have any upcoming romhacks that you can share and talk about? No, I don't have upcoming hacks to be released. I stopped to release them publicly more than 10 years ago - when I noticed that people were selling carts with my modifications. 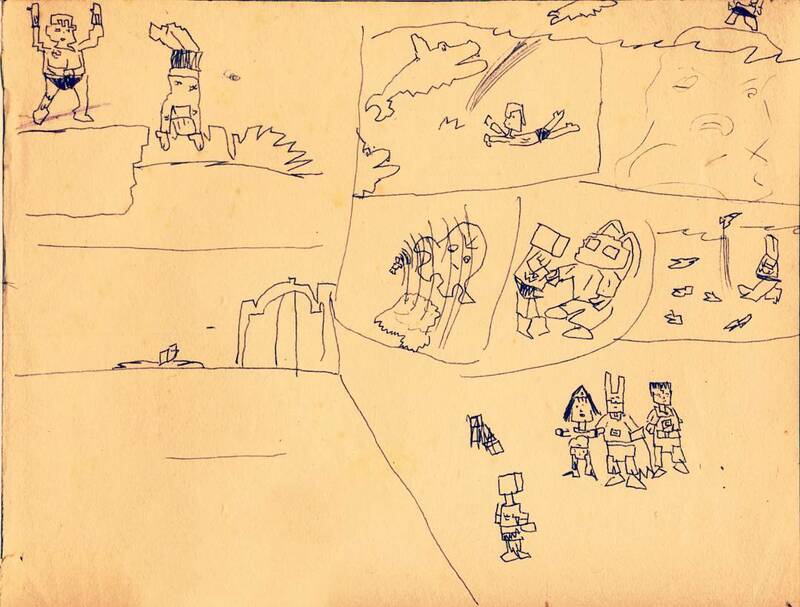 From 2008 to this day I keep my hacks private and occasionally let my friends play them when they visit me. I also make videos of some of these projects, like Alex Kidd hacked to high definition or my makeover of Super Mario World NES bootleg - all available at my YouTube channel.